Our last night in Kyoto, Kyle and I perused our neighborhood for a date night local. I’d had my eye on a tiny Tapas bar but we were turned away at the door. This has happened a few times in our three weeks here…a claim that there’s no room for us when clearly there is. 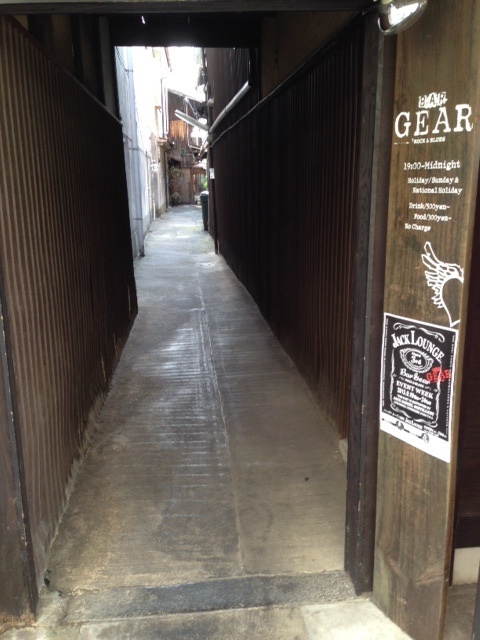 We weren’t offended by it — while disappointing, we understood a proprietors desire to hold some places in Kyoto gaijin-free. Trying again, we were enthusiastically welcomed into a small sashimi restaurant where my mouth wrestled with a hunk of octopus far too big and chewy to conquer. And Kyle’s Iowa blood craved steak and potatoes in a way that raw fish would never satisfy so we simply accepted that our last Kyoto meal would lack substance but was good company. Leaving, we noticed a discreet alleyway across from us, with a carved ice block of Jack Daniels (steadily melting) and peered in. 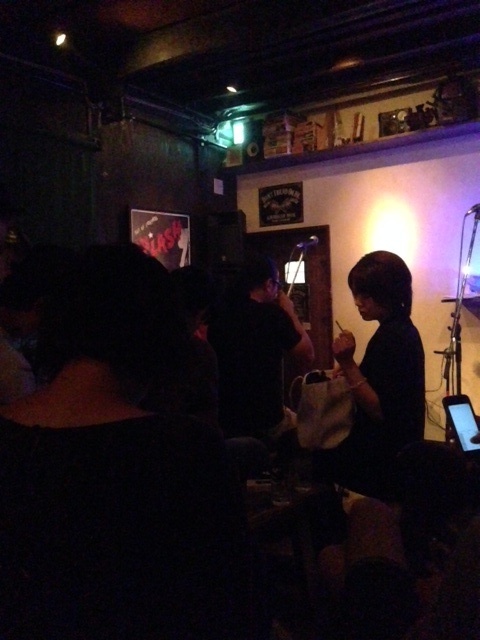 And this is how we stumbled across a Japanese blues bar. Gear Bar…wish I had taken the photo at night! The bar, Gear, was so small that as patrons arrived for the show, additional stools were brought out, and people shifted mere centimeters to make room. With twenty people jammed into the slowly smoke filling space, we waited for the show. 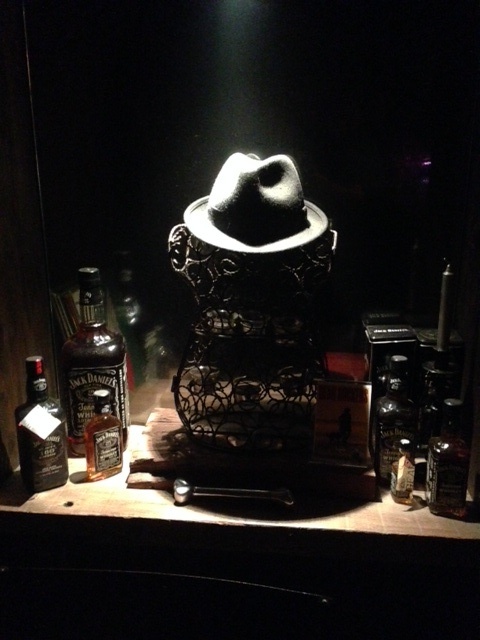 My money was on the bartender picking up a guitar — with his fedora, wild black hair and craggy face, he looked to be a Japanese Keith Richards. We spoke with the perplexingly mixed clientele squeezed in around us, learning small facts despite the language barrier. Two young women took the stage wearing shift dresses, pearls and pumps. We were confused. Opening act or bank tellers? Then they opened their mouths. Deep throaty classic blues…Buddy Guy, Muddy Waters…coming to us in part English, part Japanese. Head bobbing gold. The Blues Sisters played two sets and three ovations and we squinted through the smoke, smiled at our seat mates, moved to the music and were grateful for serendipity. At the end of the show, our neighbors shook hands with us and the Blues Sisters graciously thanked us with multiple “arigatou gazaimasu” and head bows as we purchased their CD. We spilled from the tiny space into the night on a high. This was our first time in Japan that we felt entry underneath the cloak of a private culture…a cloak we’d sewed from our own stereotypes, for sure, but difficult to truly see beneath without individual interactions. Here’s to more serendipitous moments for all! love this–a complex culture, and so wonderful to have had this experience. It’s nice when you can shed your expectations and wander into something like this.